It seems that to me summer equals turquoise?! My nail polish, the dresses that I wear, my body scrub... Everything. I admit. Blue with all its shades (turquoise included) is one of my favorite colours. Anyway...this polish, just like E.T. found its way home. Since we don't have Wet n Wild products in Croatia, I ordered this and some other polishes from nonpareilboutique . I definitely recommend this site. It came quickly but it got broken in the mail. I e-mailed the company, sent them pictures of the broken polish, and they contacted me almost immediately apologizing for any inconvenience that I had, saying that they will send me another polish without any shipping charges for me. The new polish came in about two weeks so I really recommend them. I paid $1.99 for this polish (it is its usual price in drugstores across America) plus shipping, which was reasonable. I am not sure how much it would be for just one polish because I made a bigger order but I think it is OK. It always hurts when you know how much things cost in the States but we in Europe are kind of used to it. I was pleasantly surprised with this polish! $1.99 for a full size 13.5 ml/0.45 fl.oz bottle. You can't beat that. The thing I am not too crazy about is the brush. It is just too big or too wide. Yes, it is flexible but when it is bigger than the surface of the nail, well, that is just not good. It is OK for finger nails but it might be hard to apply polish on your little toe. If a brush pass a little toe test, then it is approved by me. This one didn't do very well. I applied it but had to concentrate too much. The consistency of the polish is creamy and covers really well. At the picture above there is just one coat of polish. Yes, I know. AMAZING!!! I didn't even do the second coat. It would look perfect then but I didn't have the time. Partly, because it does dry a little bit longer. This is also a shiny polish. I didn't apply any top coat and it looks great! It held up amazingly as well. It lasted for 4-5 days on my hands (and I do a lot of cleaning, washing...), and on my feet it was even better. The ridges that you can see on my nails are not from the polish. I was getting rid of my gel nails. And honestly, this polish handled that with grace. So, it is a nice, affordable nail polish. Not as inexpensive if you order it online but nice. The brush I am not crazy about. What do you think? Like it or not? 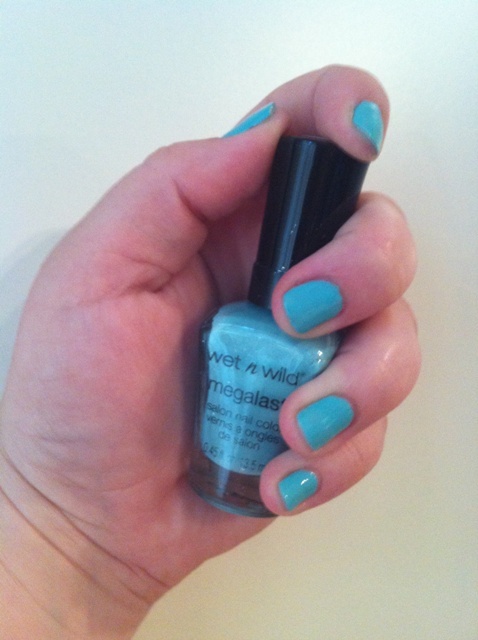 Have you tried any other megalast polishes?